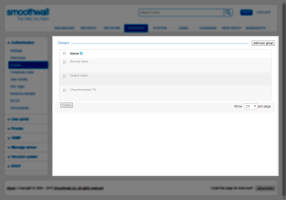 The Smoothwall uses the concept of groups to provide a means of organizing and managing similar user accounts. Authentication-enabled services can associate permissions and restrictions to each group of user accounts, thus enabling them to dynamically apply rules on a per-user account basis. Local users can be added or imported to a particular group, with each group being organized to mirror an organization’s structure. Groups can be renamed by administrators to describe the users that they contain. The main purpose of this group is to allow certain authentication-enabled services to define permissions and restrictions for unauthenticated users, that is, that is, users that are not logged in, currently unauthenticated or cannot be authenticated. This group cannot be renamed or deleted. Users can be mapped to Default Users. The main purpose of this group is to allow certain authentication-enabled services to define permissions and restrictions for users that are not specifically mapped to a Smoothwall group, that is, users that can be authenticated, but who are not mapped to a specific Smoothwall authentication group. This purpose of this group is to contain users who are banned from using an authentication-enabled service. It is possible to add groups to the Smoothwall. Currently, the Smoothwall supports 1000 groups. 1. Go to Services > Authentication > Groups. 2. Click Add new group. • Name — Configure a meaningful name for the group. • Comment — Enter an optional description of the group. Note: It is not possible to rename the Unauthenticated IPs, Default Users or Banned Users groups. 2. Highlight the relevant group. 4. Adjust the configuration as required. For a detailed description of each setting, see Adding User Groups . Note: It is not possible to delete the Unauthenticated IPs, Default Users or Banned Users groups. 1. 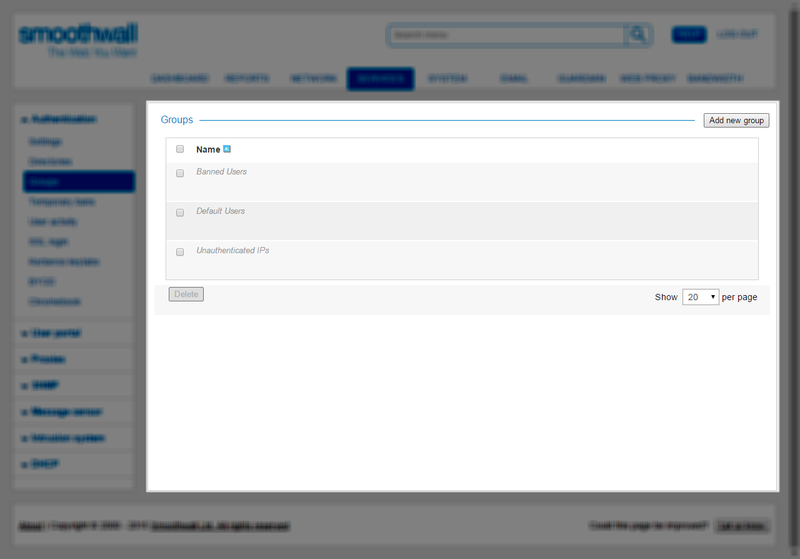 On the Services > Authentication > Groups page, select the group(s) and click Delete. 2. When prompted to confirm the deletion, click Delete.